What are the best types of clothes to wear for yoga? 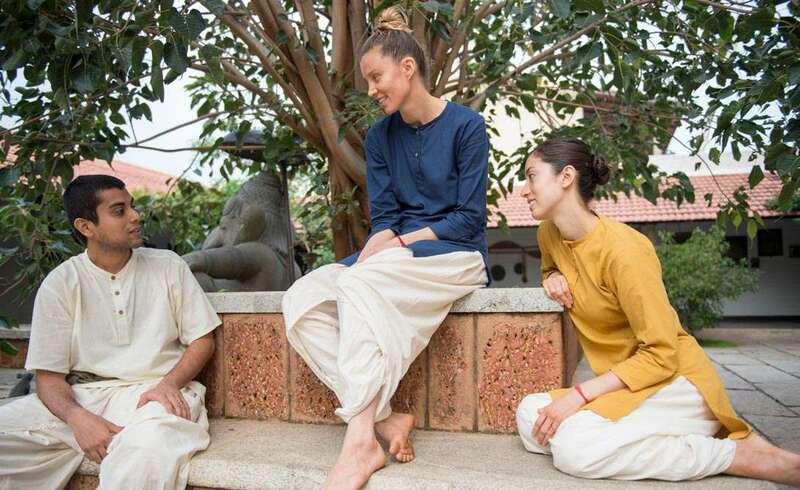 In the following article, Sadhguru explains that, today, the synthetic materials and tight fits that are commonly offered as yoga outfits actually negatively impact one’s yoga practice. When I did hatha yoga as a young boy, the only thing we were allowed to wear was a small loincloth. The idea was that there should be as little obstruction as possible. Traditionally in India, people did not wear stitched clothing. Both the dhotis for men and the saris for women are just pieces of unstitched cloth. When clothing is stitched, the movement of energy gets restricted to some extent – you want to minimize that when doing sadhana. This does not mean that you need to start wearing a loin cloth, but yoga practitioners should not wear synthetic clothing such as the kind that athletes wear. The kind of clothes you wear can impact your physical and mental health and wellbeing. Why organic clothing matters is because there is a huge difference in the way your body functions when you wear synthetic clothing and when you wear organic clothing. You needn’t believe anything that anyone says. Try it out and see how it feels. Wear raw silk or cotton – even your inner garments – for a week and see how your body feels. Then wear something tight and synthetic and check. You will see a big difference in the level of comfort and ease at which your body functions because there is a certain aspect to what wraps the body. Another thing is, how you can exude who you are is also enhanced or restricted by certain substances. Cotton and silk are best for your system. Particularly raw silk or cotton that is not treated in any way has a certain kind of impact. Since organic raw silk may be too expensive and difficult to get, organic cotton would be the best option. Wool is all right too. It is not that if you wear synthetic clothing you will fall dead. You can still meditate and be the same person even if you wear synthetic from top to bottom – but with a little struggle and effort. Read more on organic cotton clothing.